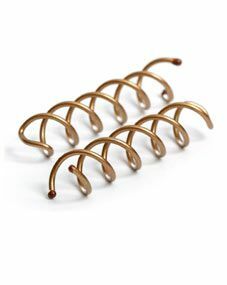 Goody created this miraculous little corkscrew hair accessory, the Spin Pin. While it may look a little daunting, it truly does create nearly-instant updos, buns, and French twists. Read on to learn how to use it correctly. The first step towards creating an easy updo with the Goody Spin Pin is to gather hair into a loose ponytail. For a traditional bun, gather hair at the nape of your neck. If you want your chignon higher, gather hair into a ponytail in the center or closer to the top of your head. You do not need to use a ponytail holder. If you recently washed your hair, you may want to spritz in some dry shampoo, hair spray or wax-based product for extra hold. Next gather hair around the base of your ponytail into a bun or French twist shape. Insert the first Spin Pin by twisting it into your bun or chignon. The pin goes in very easily, so if you're doing it right, there's no need to shove or jam it in. Twist it in clockwise. To remove the Spin Pin, twist counterclockwise. Twist in the second spin pin into you bun on the opposite side of where you placed the first pin. Again, it should twist in easily and goes in clockwise. Do not interlock the two Spin Pins as this can cause hair to tangle. Here's how my chignon looked — it only took two minutes to create. I didn't need any extra bobby pins and it stayed in place all day long! If your hair is fine or you just washed it, spritz in a texturizing product. You do not need a ponytail holder or any extra pins or accessories to create this easy updo. To create a French twist style, arrange your bun vertically and twist pins in. To create a side bun, start with your ponytail on the side. Twist pins in clockwise. Remove them counterclockwise. Do not interlock the pins. Your updo doesn't have to be perfect. A few loose tendrils in the front or back make it more stylish. The Goody Spin Pin is available online and at drugstores nationwide.